Preparation of this overview prompts a few reflections I wish to share with readers. Equally, I hope to read your reactions in future letters to the editor. The dramatic evolution of the Scarboro monthly is clearly revealed by this survey of some 70 past issues. Covers, inside layouts and the range of topics have changed substantially over the decades. I would say two factors the changing times and changing editors are mainly responsible for this ongoing development. The impact of world events on magazine content, for example, is very evident in the 1955 editions. That decade saw a rapid escalation in the ideological Cold War between the Capitalist West and Soviet-led Communist bloc. In China, Scarboro missionaries suffered harassment, imprisonment and then exile from the missions they had so carefully tended for 30 years. In the United States and Canada, too, the news media reported the stormy hearings of congressional committees into “un-American activities.” “Better dead than Red” was a popular slogan. Many Canadian Catholics joined in the Fatima-inspired prayer crusade for “the conversion of Russia.” These events influenced many pages of the Scarboro journal that year. Similarly, each of the 17 men who edited China and Scarboro Missions left his personal signature on the issues he shepherded to publication. Each brought a unique personality and individual background to the editorial chair. And each, of course, was affected in distinctive ways by the changing world he lived in. All Scarboro editors have been committed to the call of the Gospel, to the Christian values that Jesus Christ taught, lived and died for. While these Gospel norms do not change, perceptions and applications of them have been developing from one generation to the next, particularly since Vatican II. Moreover, each editor had his own sincere convictions as to what these Gospel values required in terms of daily living, pastoral priorities and public policies. Yet, however much their interpretations differed, each editor, from John Mary Fraser to Gerald Curry, served the will of God and observed the teachings of the Church as faithfully as he could. To sum up: Whoever wants to know more about the Scarboro Foreign Mission Society – relative, friend, supporter, researcher or interested onlooker – cannot afford to ignore its monthly voice. Here we find the continuing story of this very Canadian missionary movement as told by the members themselves. Hundreds of Scarboro priests, lay men and women missioners and occasionally other men and women religious have described their diverse mission experiences and shared their personal reflections from more than a dozen lands on three continents. 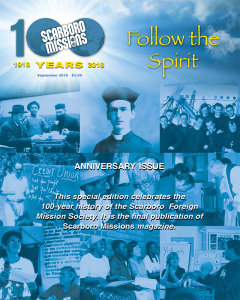 As a result, the history of Scarboro Missions, founded in November 1918, and the history of its periodical are almost as one. In reporting this living history, one essential has remained constant in over 800 issues of the Society’s public voice. The focus on Christian mission has never wavered from the first issue of October 1919 to the edition you are reading today. Whatever else may change in future editions, the focus on mission is certain to remain constant, especially as the church engages in the “new evangelization” John Paul II prescribes. The author of this article, Grant Maxwell, died in 2003 at the age of 81. He had a 50-year career as a journalist and was familiar with our Society’s monthly magazine having spent many hours poring over past issues, an excellent source for a detailed recording of Scarboro’s mission history. Grant first researched Scarboro’s early years in China, which he described in the book, Assignment in Chekiang, published in 1981. Grant again researched many issues up to the 1990s in order to prepare this two-part article.